Area of interest: Welsh Mining History. Classes of membership: Newsletter only £5 p.a. Overground (field meetings) £10 p.a. Underground £20 p.a. Publications: Two Newsletters per year (typically 40-plus A5 pages) per year (Spring and Autumn) plus occasional volumes in the series Welsh Mines and Mining. Current projects:	 Many members are involved with individual research projects. Most archaeological and conservation projects are done in conjunction with the sister organisation, the Welsh Mines Preservation Trust. Services:	 Some members carry out a mining history consultancy. Activities: Two weekend field meets per year (or, in some years, a weekend field meet plus a one-day conference). Welsh Mines Society weekend field meetings are held twice a year and are well attended. 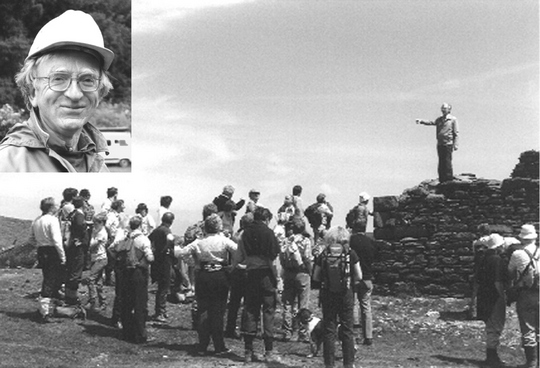 The photograph shows the late David Bick (inset), founder and first President of the Society, addressing members on a visit to a mid-Wales lead mine site.